Float Light in a chamber that lets you experience true nothingness. Float in one of our several Float Light Rooms or our Float Light Pods. 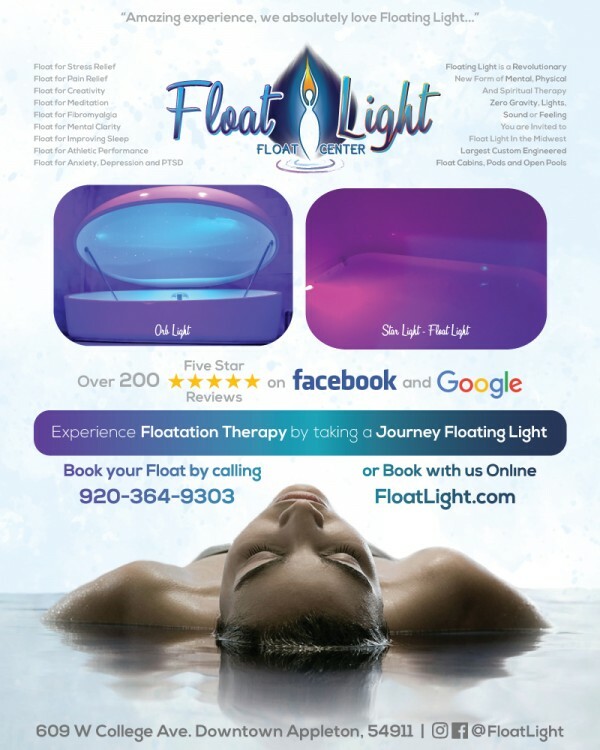 Float Light with us Downtown Appleton, Fox Cities in Wisconsin and the Mid West. 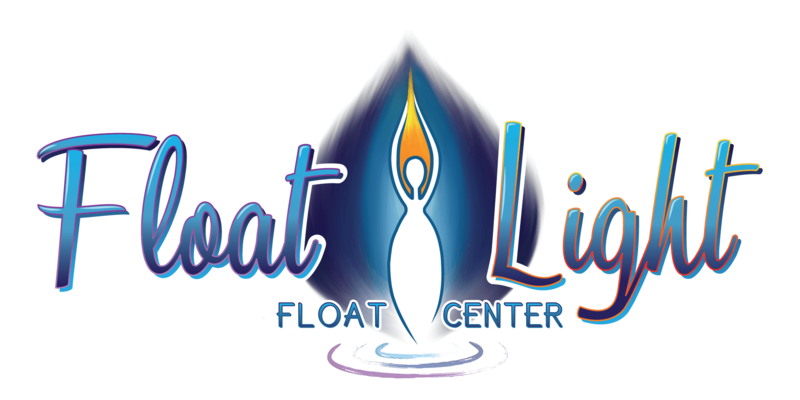 Asking yourself, “where to float?,” look no further than Float Light; more than a spa or health and wellness center, we assist in creativity, relaxation, meditation and overall exploration of self through the power of floatation. Some people call it floating, the ultimate meditation, R.E.S.T or sensory deprivation. No matter the name, it turns out being completely alone laying naked in a foot of water, experiencing nothing is extremely good for you. Floating can aid those who suffer from numerous ailments such as Stress, Fibromyalgia and PTSD to name a few. But floating is so much more! Athletes benefit from floating, just ask the New England Patriots who just recently built a float center in their locker rooms. Artists use floating to find inspiration in their next masterpiece. The average person might use the chamber to discover enlightenment or experience something otherworldly. The experience is truly subjective to the individual and what they create from within their own mind. Float Light in a chamber that lets you experience true nothingness. Featuring float rooms, float pods, float tanks, sensory deprivation tanks all with a unique atmosphere, book now! By Joshua on February 1, 2019. Edited on January 24, 2019. Stop reading this review and book your first float. Float Light isn't just a place to get in a float tank. The whole place and staff are oriented toward relaxation and introspection from the moment you walk in the door. The tanks are top notch, the temperature is perfectly regulated, the suites are luxurious, clean and quiet. The amenities are one of the touches here that set Float Light apart. You will find in your suite a shower, soft towels, a comfortable robe for after the float, soap, shampoo, ear plugs and a vinegar solution for your ears. You can customize your experience with any color lighting you'd like. You can select the music that plays in the tank (and of course you can turn it off). There is a lounge for your post float reintegration where you'll be offered tea and water and can chat with the friendly staff and other floaters. Nothing about the experience is rushed. Stop reading and go book your float. You won't regret it. By Anne on July 3, 2018. Edited on July 2, 2018. Please let yourself enjoy the wonder of floating. My 73-year old body appreciates it so much! Anne, It was truly our pleasure to guide you along your journey. Floating Light can have a remarkable impact on our minds, bodies and spirit. Let that "glow" feeling stay with you; when you need us again, we will be here waiting to continue to help guide you along your journey. By Linda on April 14, 2018. This was my first float and it exceeded my expectations. The facility is beautiful, clean, and welcoming. A true spa feel. I floated in the pod and cannot wait to try the other rooms. Floating alleviated stress more than any other method I use and the feeling is staying with me. I highly recommend this experience and look forward to my next float. Linda, thank you for your kind words and support. We spent 6 years building Float Light for the people who matter most, our guests. Thank you so much friend, be at peace. Float Light offers sensory deprivation / float tank therapy in the Appleton, Wisconsin area. They will help you get the most from your float tank experience. 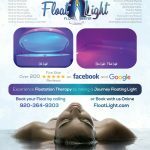 Contact Float Light now to schedule a float. Are you considering trying floating in Appleton? Float Light has a float tank available for your use. Come try out floating in a sensory deprivation tank to see and experience the benefits of floating for yourself. 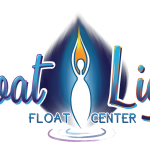 Call Float Light at 1-920-364-9303 or stop by to set up your first float in Appleton. This entry was posted in Wisconsin by jroug@floatlight.com. Bookmark the permalink.